The Torah is a central and imperative documentation within the Jewish religion. Within Judaism, the Torah is referred to as the Law; whereas, in Christianity, the Torah is called the Pentateuch and is referred to as the original Hebrew Bible. 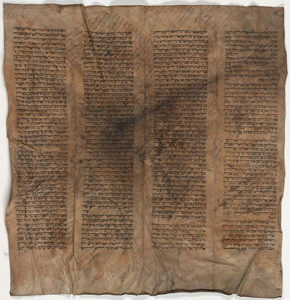 The Torah signifies the Old Testament which only includes the first five books of the bible: Bresheit or Genesis, Shemot or Exodus, Vayicra or Leviticus, Bamidar or Numbers and Devarim or Deuteronomy. These books are said to have been written by Moses in the sixth century. The Torah is heavily regarded within the Jewish community; however, women has been restricted from accessing the Torah. The use and accessibility of the Torah is heavily based on gender. The restriction of women within the Jewish community is evident through the predominant male character in Yezierska’s novel, Rob Smolinsky. Throughout the novel, the women characters are prohibited to reading or studying the Torah. While Rob’s entire life and everyday routine incorporates reading the Torah; he is so engaged with the book that he finds little time for anything else and is not employed as a result. The article, “Dignity, Honor, and Equality in Contemporary Halachic Thinking: The Case of Torah Reading by Women in Israeli Modern Orthodoxy” by Ronit Irshai discusses both opposing and supporting arguments for women’s Torah reading. Irshai says, “It appears that religious women, who have long since abandoned essentialist distinctions in their secular lives and are unwilling to accept various gender-based restrictions in this sphere, nevertheless accept male–female distinctions unquestioningly in their religious lives”. The common practice for women in the Jewish community is to accept gender limitations whether they accept them or not. This acceptance is seen in Bread Givers as Rob Smolinsky’s daughters and wife does not question him or attempts to further their religious knowledge. Thus, Rob’s control and power over his family is a reflection of the nature and normalities of a religion that does not support the equality between men and women. Irshai, Ronit. “Dignity, Honor, and Equality in Contemporary Halachic Thinking: The Case of Torah Reading by Women in Israeli Modern Orthodoxy.” Modern Judaism, vol. 33, no. 3, 2013, pp. 332–356., doi:10.1093/mj/kjt010.